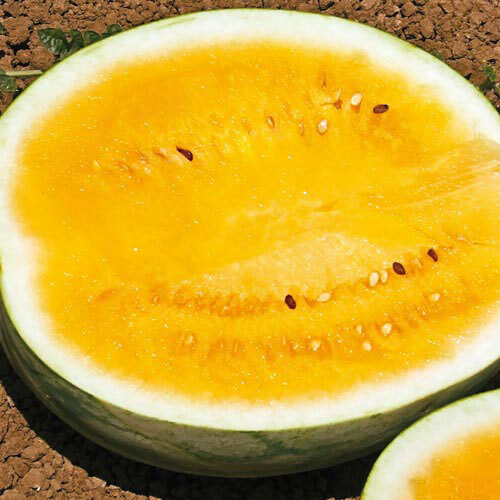 Orange Krush Hybrid Watermelon | Gurney's Seed & Nursery Co.
Big 17- to 20-lb. fruit features brilliant orange flesh with irresistible sugary-sweet flavor and juicy texture. Vigorous, healthy vines and fusarium wilt tolerance ensure huge yields. 78 DAYS. Spacing1 inch deep, 4 - 5 to a hill. spacing hills 6 feet apart. When seedlings grow 2 - 3 inches tall, thin to 2 plants per hill. ColorFeatures a Crimson Sweet rind pattern with light orange to yellow, crisp flesh. Soil RequirementsLight, rich, sandy, well-drained soil. CommentsTolerant to fusarium wilt. Great tasting. Size17 - 20 lb. fruit weight. Depth1 - 1 1/2 inches.